Johns Hopkins University students will no longer need a campus identification card to get into their dorms, pay for pizza or do laundry. 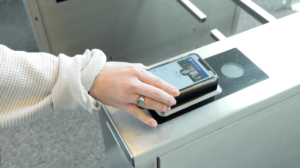 Starting today, a flash of their iPhone or Apple Watch will handle all of that and more as the university becomes the fifth in the country to offer students the option to add their campus ID to Apple Wallet. Students who choose to add their campus ID to Apple Wallet will be able to use their iPhone and Apple Watch as building keys, to pay for things on and off campus, and for anything else that currently requires showing a campus identification card, the J-Card. By simply placing their device near a reader where physical student IDs are accepted, they can enter dorms, print documents at the library, buy lunch and shop at the university book store. In addition to working at all campus dining facilities, the J-card on iPhone will also work at numerous off-campus businesses including Eddie’s, Pete’s Grille, Chipotle, 7-Eleven, CVS and Insomnia Cookies.The J-card credentials are also protected on the app by two-factor authentication. J-Card in Apple Wallet works with iPhone 6 and later, and Apple Watch Series 1 and later.